Part #46406 is for the Loaded Wichita with removable smoke stack. For us to see what you are experiencing, please email a picture of the cover installed to customerservice@yodersmokers.com Include the serial number and manufacture date of your grill in the email. 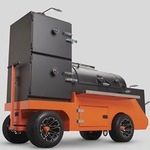 Send an email with the information to customerservice@yodersmokers.com and we will get the cover taken care of. Should of bought a BMW. You would of kept it in a garage filled with nitrogen. My cover is over three years old for my YS640, I keep it under a patio cover, it never gets rained on or do leaves come withing 20 feet. My cover still looks pristine, bit dusty. We own smokers, not a shiny car. I can't imagine a cover blowing over a steel wheel so the steel is exposed to the elements being of a major concern. It's a steel wheel and will outlast most humans. Looks sad. Droopy. Hard to get it out of the rain when it's sideways!.. Stay safe! I'll post a pic of my smoker home tomorrow in's nat habit. Okay. I see the cover for your Egg. It's really thick and shiny. I can see why it's better. How many feet of material vs your cover. Do the math. Then the cost. An Egg is kinda a shiny thing that so many are marketing for. The more bling the better. Thus the cover. Thus the diamond one being sold. Yep. I'm amazed you went to this effort. If it was me I'd buy brass rivets and a tool to affix them to the cover and get some bungee cords to hold the cover from exposing a solid steel wheel that might someday show signs of use. If it matters. I see the Egg to the left. Lets move it to the right of the smoker for the next 3 years. Make sure it gets maximum sun every day. Get back to me.